The city is also a landscape for the birds. The Scottish-American author and landscape architect Ian McHarg proposed that the classical dichotomy of urban versus rural be reconceptualised. This is illustrated in his 1969 book Design With Nature as a yin-yang ’double hand diagram. In it one sees processes of nature penetrate and affect the city and the urban condition—at the same time—merging into the natural landscape. A fresh condition of landscape in which urban and rural converge and are conjoined in a new perspective are reflected in notions of ‘urban nature’ and ‘urbanised landscapes’. This has long since entered theories and mainstream practices of urbanism. In the Arctic, where great expanses of land are uninhabited, this is perhaps not so obvious, particularly as up to 70% of the Arctic population actually resides in urban areas. Tormod Amundsen is a bird watcher (a “birder”) as well as an architect, residing in Vardø (population around 2000 humans, as well as 276 species of birds) with his wife and partner, Elin Taranger. The historic fishing community of Vardø faces the Barents Sea. It enjoys all year ice-free waters, and is the only Norwegian city that is technically Arctic and finds itself right on the 10°C July isotherm separating the landscape typologies of tundra and taiga. 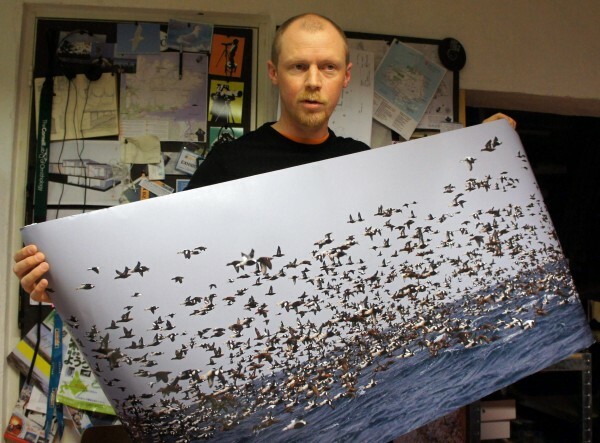 Tormod Amundsen and the King Eider Vortex – flocks of more than 10000 King and Common Eiders found in the Vardø waters. The architectural practice of these birders has resulted in a series of well-designed and innovative bird watching shelters, photo hides and other forms of birding infrastructure. These are located along the National Tourist Route leading to the town, along the periphery of the city island, but also in other more inaccessible locations that are attractive to the more discerning birders. Their designs are distinctive, asymmetrical and well-executed examples of contemporary trends in architectural design language. The constructions stand out in the open treeless Arctic landscape. No attempt is made to disguise their appearance, and as Amundsen says, “We are not into camouflage – we are not into killing”. Rather, the structures announce their presence to the visitors, functioning as magnets of human activity, hereby protecting large wildlife areas from human impact. At the same time, the birds do not mind the visual presence of the shelters. The structures are located at carefully calculated distances from the bird habitats, and their designs are informed by a combination of local knowledge and the practices and preferences of the international birding community that are the real clients for this peculiar architectural commission. The shelters are also informed by practical fieldwork involving experimentally moving across the landscape to identify ideal points of observation. The shelters achieve their usefulness in three ways. They carefully balance the need for visibility in order to attract and concentrate human activities, the practical requirements of the birders and sensitivity to the needs of the birds. For the birds, the architecture of the well-located and designed shelters is just as much a landscape as the natural features surrounding it. In this way, the city is also a landscape. According to Amundsen, fishing—as it is carried out in Vardø—and birds go very well together: fishing harbours are in fact fantastic and biologically diverse. One of their recent projects for a photo hide is to be found floating in the harbour of Båtsfjord where ducks can observed at very close range. 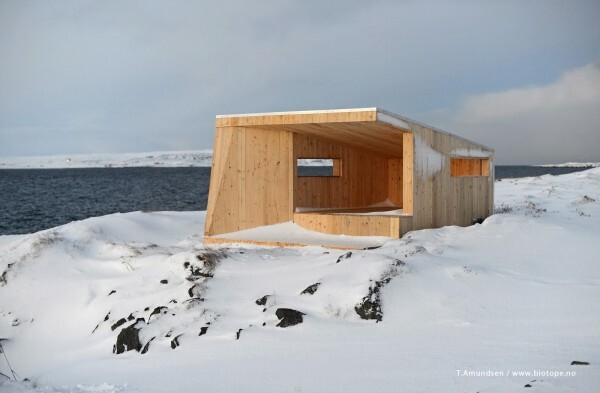 The architecture of Biotope is highly specialised and requires intimate familiarity with the location, local climate, and behaviour of resident and migrating species. This is knowledge that is constantly evolving as changes in bird movements are observed from year to year. The shelters and other enabling infrastructures not only accommodate the visiting birders and help guide the movements of other tourists but they also play a role in mediating the importance of the urban and natural landscape to local inhabitants. According to Amundsen, due to their practice “people are discovering their own nature in a new way”. Through the agency of the birds as well as of the birder-architect, the community is made aware of the natural landscape, but also of the fact that the city in which they reside is also a landscape. Ian McHarg, Design With Nature, New York, Natural History Press, 1969.